With the advent of new social media platforms, the way we share our stuff has changed dramatically over the past few years. For example, Instagram is a photo/video-based platform that allows users to share pictures on their feed. With new and new features coming up, 360-degree photos has been quite a trend on Facebook. Facebook is one of the first platforms to support uploading of 360-degree photos/videos; It’s fun if you haven’t tried it anytime. 0.1 But My Phone Doesn’t Have This 360-degree Feature! But My Phone Doesn’t Have This 360-degree Feature! It’s completely alright if this is the case because If you got an android device, there are a ton of camera apps out there that will help you take 360-degree or even long panoramic shots for that matter. We’ve taken the time and curated some of the best 360 degree camera apps for Android. This is a camera app developed by Google. Google calls it Virtual Reality(VR) photos. However, Google recommends that these photos are best-viewed in a VR player or Google Cardboard VR. Capture and share moments with virtual reality (VR) photos (VR photos let you experience scenery and sound in every direction and 3D, making near things look near, and far things look far). This camera application is built to capture 360-degree photos and videos as well from every possible angle. The one key feature that differentiates 360Cam from other apps is that remote control feature. It allows you to control the 360cam from your Android smartphone too. With these, you can import and play your 360-degree photos and videos and share it with your friends. 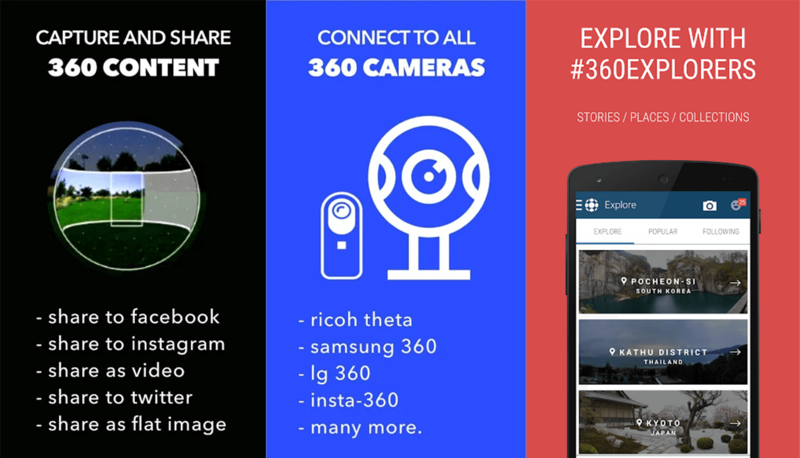 The 360cam app will let you remote control your camera, import your 360 contents into your phone and share it with your favourite social networks. Use the 360cam app for Android as a remote control to record videos, photos & time lapses on your 360cam. Switch capture mode directly from your 360cam app and get a live preview before starting to shoot! 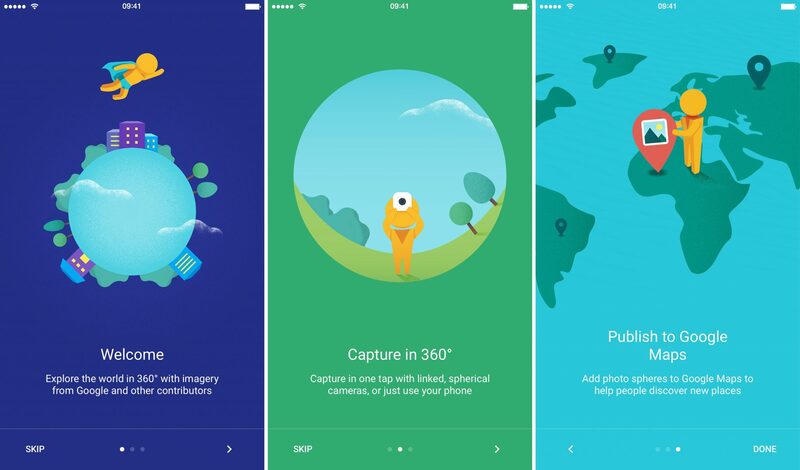 Use the 360cam app for Android to play your 360 photos and videos in our built-in 360 player, and try the different viewing modes: panoramic, 360 and little planet! Share your photos on all major social sites in a few steps! Enjoy the best 360 videos & photos from Giroptic’s partners and content creators. This app is indeed one of the best apps in play store for capturing 360-degree photos and videos. The app has been downloaded more than 5 Million times and is rated 4.0 on the store. The features of this app include capturing and viewing 360-degree photos as either flat images or viewing them in a VR headset like Google Cardboard. It has an HD option to get High-quality panoramas. It also comes with an option of directly sharing the photo to Facebook, Twitter or Tumblr. In fact, this app is called the Instagram for Panoramas. Another excellent application by Google again, this app allows you to capture 3D photos on Android and upload these photos to Google maps as a photosphere. The best thing about this app is you can view the photos shared by others and explore different locations in the 3d view. If you have a Google Cardboard, then you can immerse yourself in 3d mode via photospheres. In one way this isn’t a 360-degree camera, but it has cool features that you must check out. For selfie-takers out there this can take selfies by adding a 3d effect. Also, these selfies can be shared with your friends or even be made as a wallpaper on your devices. Unlimited number of Phogies (Pro). Enables the creation of unique selfie shots with 3D effect. Enables sharing via email, social networks. Creates mp4 files you can use to share via Facebook, Google+, etc. (high quality in Pro). Creates gifs available to share via Google+, Tumblr, etc… (high quality in Pro). Set Phogy as 3D effect lively wallpapers (Pro). A various number of filters to customize your Phogy (Pro). Quality ratings (from 1 star to 5 stars) announced after taking the Phogy. Control (set) the sensitivity of Phogy motion from low to high. Which one of these Best 360 Degree Camera Apps for Android did you download and try? Do let us know in the comments below.